Casey's Dream Tammy Jo Georgia, a 6 yo broodmare, owned by Uniquine QH Stud entered her first dressage show, regionals on 13/11/2010. There were 46 horses competing. She has now been under saddle for 6 months. She got 63,85% and 63,75% for her two classes and she came second and third in her respective classes. "What a super horse, with good movement. 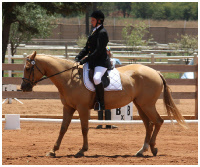 Great prospect as a dressage horse". 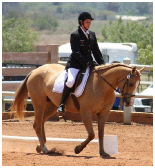 She is being shown and ridden by Danielle Deetleffs.